Adapted from Florida Fish and Wildlife Commission's "Living with Alligators and Crocodiles"; USFWS's Wildlife Fact Sheet, "American Alligator Alligator mississippiensis"; and TPWD's "Populations and Harvest of Alligators in Texas 2001". Alligators and humans have shared marshes, swamps, rivers and lakes of the Gulf Coast and Southeastern United States for many centuries. The original range of the species extended as far north as New Jersey, southward to the South Atlantic and Gulf Coasts, inland to the confluence of the Arkansas River with the Mississippi River and westward to the 100th meridian in Texas (Kellogg 1929, Lauder 1965). Today, the alligator's range extends east to the Carolinas, west to Texas and north to Arkansas. Historically, alligators were depleted from many parts of their range as a result of market hunting and loss of habitat. Thirty years ago many people believed this unique reptile would never recover. In 1967, the alligator was listed as an endangered species (under a law that preceded the Endangered Species Act of 1973), meaning it was considered in danger of extinction throughout all or a significant portion of its range. In 1969, Texas provided complete protection for the alligator. A combined effort by the U.S. Fish and Wildlife Service and state wildlife agencies in the South saved these unique animals. The Endangered Species Act prohibited alligator hunting, allowing the species to rebound in numbers in many areas where it had been depleted. Shortly after their protection began, alligators rapidly repopulated areas that were once heavily hunted. As the alligator began to make a comeback, states established alligator population monitoring programs and used this information to ensure alligator numbers continued to increase. In 1984, after 15 years of protection, Texas began harvesting wild alligators through a carefully monitored program. 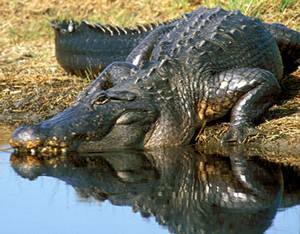 In 1987, the Fish and Wildlife Service pronounced the American alligator fully recovered and consequently removed the animal from the list of endangered species. Although the American alligator is secure, some related animals -- such as several species of crocodiles and caimans -- are still in trouble. For this reason, the Fish and Wildlife Service still regulates the legal trade in alligator skins, or products made from them, in order to protect these endangered animals with skin that is similar in appearance to alligators but are illegal in the commercial market. The story of the American alligator is one of both drastic decline and successful recovery, a story of state and federal cooperation, and truly one of the prominent success stories of the nation's endangered species program.